I have written many times on the insidious and corrupt relationship between the Nigerian government and Shell Nigeria. It is now confirmed by the recently released Wikileaks cables on Nigeria. The leaks provide an additional dimension to the relationship between the Nigerian government, Shell (an empire in itself) and the United States government. The ‘NaijaLeaks’ should be read in the context of ‘oil complex’ – the relationship between oil companies, Nigerian federal and state governments, traditional rulers, militants, local communities and now, unsurprisingly, as the leaks reveal, the US government. Shell. Photo by Ryan McFarland under Creative Commons licence. This militarized relationship was exposed by the revelation that the Nigerian military had framed Ken Saro-Wiwa with the support of Shell. It is clear that Shell was implicit in the execution of the Ogoni Nine. The most interesting fact revealed is, of course, Shell’s total infiltration into all levels of Nigerian politics and governance. The company was essentially a spy for the US government. I find this somewhat amusing, as Nigerian governments over the past 40 years have been bed partners with Shell, both acting out the most brutal attacks on communities and the environment. But Nigerian governments did not know that Shell was also very much in bed with the US government. 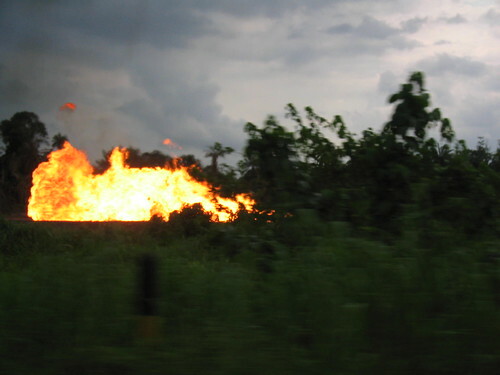 Shell gas flare by Oloibiri. Photo by Rhys Tom under Creative Commons licence. In retrospect, this news is hardly surprising, but if one looks at Nigeria’s side of the relationship with Shell, it is clear they were not aware of the duplicity of their ‘partner’. They were even more stupid because they forgot that Shell had ‘seconded people to all relevant ministries’. A further series of cables shows that in 2005 Shell funded a militant ‘peace camp’ which backfired after the rebels discovered Shell’s participation. Closely related to the ‘NaijaLeaks’ is the revelation that the majority of oil spills in the region were a direct result of Shell Nigeria’s negligence and not, as is often wrongfully claimed, due to sabotage by local people or militants. Environmental activists in the Niger Delta and internationally have for years insisted that this was the case. For the second time in two years, last week Shell Petroleum Development Company (SPDC, or Shell Nigeria) admitted that their figures were wrong. The first time was in 2009, when they admitted that 50 per cent, not 85 per cent (as they had claimed before) of all oil spills in the Delta were caused by acts of sabotage. Now they have once again confessed to wrongly over-estimating sabotage by nearly one third. These corrections have again challenged the honesty and credibility of Shell and its operations in the Niger Delta. Under Nigerian law, oil companies are not required to clean up and compensate for oil spills attributed to sabotage. The implications of this for the region are huge, because Shell has repeatedly used lies about sabotage as an excuse not to clean up the pools of oil spread across the Delta. 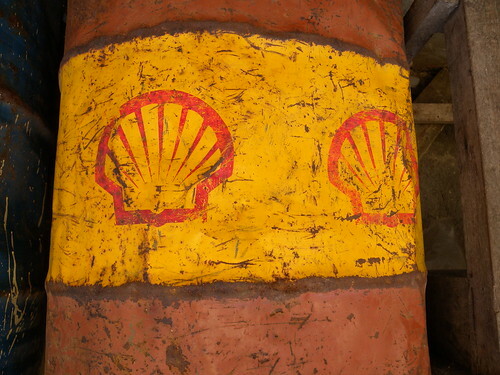 Now we find that Shell has deliberately doctored the figures to avoid financial and ethical penalties. 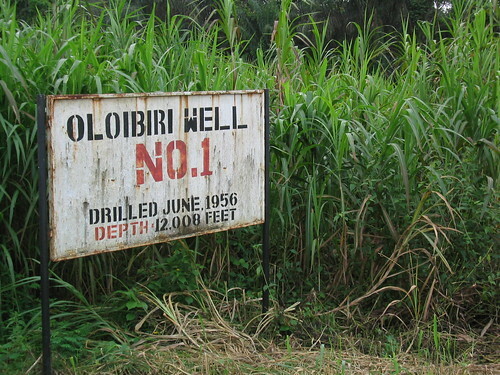 Oloibiri-1 well, the first commercial oil well in Nigeria, completed in 1956 by Shell. Photo by Rhys Tom under Creative Commons licence. into the activities of the oil giant continue.